Happy Earth Day! 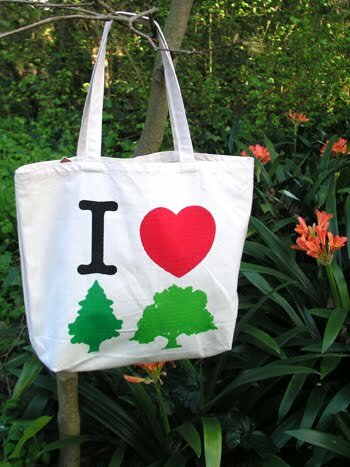 Tell us what you are going to do this year to be kinder to our planet and we'll give away our I 'heart' Trees Recycled Canvas Tote Bag to the person with our favorite answer. Please leave your answers as a comment on our blog! Here's my good from this year: 1. I commute on public transportation 2. I eat mostly organic fruits and vegetables 3. I rarely eat red meat 4. I don't buy products containing palm oil 5. I compost and recycle 6. I try to spread awareness about conservation issues 7. I donate and volunteer with organizations that work towards preventing or restoring habitats of endangered animals. This year I am going to buy a drying rack and hang dry more of my clothing. I will also make a more conscious effort to turn of lights, watch my paper usage and take shorter showers. When I fly I will purchase carbon offsets through programs like carbonfund.org. Leave your comments about what you are going to do this year to help our planet! You may leave comments until Sunday, April 25th at 12:00 pm PST. I will announce the winner on Monday, April 26th.